Israeli Prime Minister Benjamin Netanyahu says his new coalition government will hold serious talks about Iran's nuclear program and promote a "responsible" peace process with the Palestinians. Israeli Prime Minister Benjamin Netanyahu unveiled a revamped coalition government on Tuesday, forming a broad alliance with the chief opposition party that could free his hand to take bold action on peace with the Palestinians and decide whether to attack Iran. In a stunning reversal, Netanyahu called off plans to hold early parliamentary elections and struck an agreement with the rival Kadima Party. Netanyahu now presides over a coalition with 94 seats in the 120-member parliament, one of the broadest governments in Israeli history. Netanyahu and Kadima's leader, Shaul Mofaz, appeared together at a midday news conference, saying their alliance would bring much-needed stability to Israeli politics. They promised close co-operation on Iran and expressed hope that long-stalled peace talks with the Palestinians would resume, though signs of differences on the Palestinian issue quickly surfaced. Netanyahu's current coalition, which had been remarkably stable since taking office in March 2009, has been riven by divisions in recent weeks over court orders to demolish two West Bank settlement outposts and to end draft exemptions for tens of thousands of ultra-Orthodox Jewish men. Unable to bridge these differences, Netanyahu announced Monday he would push for early elections in September, more than a year ahead of schedule. But in an overnight deal that stunned the nation, he instead joined forces with Kadima, the largest party in parliament with 28 seats. "I was ready to go to elections," Netanyahu said. "But when I learned that a very broad government can be established ... I realized that stability can be restored. That is why I have decided to form a broad national unity government." Ending controversial draft exemptions granted to ultra-Orthodox males. Reforming the volatile political system. Promoting a "responsible" peace process with the Palestinians. Peace talks have been stalled for more than three years over Israel's policy of building settlements in the West Bank and east Jerusalem. The Palestinians, who claim both areas, have demanded a settlement freeze. Netanyahu would not say whether he would now consider a settlement freeze. Instead, he repeated his calls for Palestinian President Mahmoud Abbas to return to negotiations without any preconditions. "I hope that President Abbas will take advantage of this opportunity," he said. 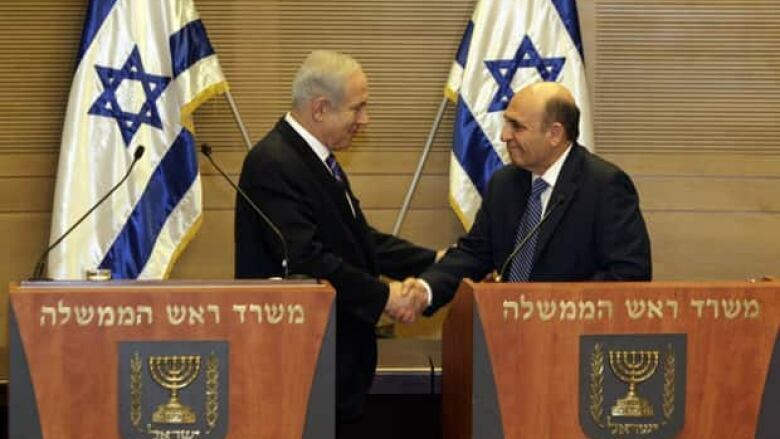 Mofaz, however, said he would present new ideas to Netanyahu. Mofaz has suggested pursuing an interim arrangement with the Palestinians addressing border and security issues while a final deal can be reached. Netanyahu also promised "serious and responsible" talks on Iran with Mofaz. Israel, like the West, thinks Iran is developing nuclear weapons, a charge Tehran denies. Netanyahu has hinted that Israel would be prepared to strike Iran's nuclear program if it feels threatened. Mofaz, a former military chief and defence minister, has spoken out against an Israeli strike on Iran, though he has a history of reversing his position on key matters. Netanyahu said he and Mofaz already have had many discussions about Iran and will continue to hold "serious and responsible" talks on the matter. As a former military chief, Mofaz's opinion could carry great weight in a decision on whether to strike.